School ratings — be they labels ranging from “excellent” to “in need of improvement,” one to five stars, or A to F grades — are one of the most powerful tools we have for communicating expectations for school performance, for prompting action whenever those expectations are not met, and for helping parents and others understand how their child’s school is doing. By defining what it takes to earn an “excellent” or “good” rating, rating criteria can make it clear that to be considered a high-performing school, a school has to be serving all — not just some — of its students well. And by identifying schools that are not meeting expectations for one or more groups of students, ratings can prompt action and help districts and states better target resources and supports. Of course, ratings alone are insufficient; states should also provide parents, community members, and the public with more detailed reports (sometimes called data dashboards) that clearly present a range of information on school quality — including how schools are doing for each group of students on all the indicators that go into the rating. Without school ratings, however, parents, educators, and all others are left to cipher through pages and pages of numbers with no guidance about whether their schools’ results are up to par. And most important for all of us who are committed to raising achievement for all students — including low-income students, students of color, English learners, and students with disabilities — is that in the absence of ratings built around the performance of all student groups, it is all too easy for schools and districts to sweep these students’ outcomes under the rug. The purpose of these fact sheets is to provide advocates with information they need to help make sure that their state leaders put in place school rating systems that truly reflect how schools are serving all groups of students. Act and identifies key parameters for an equity-focused school rating system. The fact sheet on setting goals discusses how states could approach setting ambitious and attainable goals for schools. The fact sheet on ensuring that all groups of students matter suggests ways of making sure that how schools are serving each student group counts in its rating. That’s why, even though Congress left a lot of discretion to states in crafting accountability provisions under the Every Student Succeeds Act (ESSA), it was clear that ratings must be purposefully designed to reflect how schools are doing for all groups of students.1 Otherwise, schools’ average all-student results will, by default, become their ratings, removing the incentive for schools to tackle inequities in opportunity and achievement. The way ratings are designed — meaning, which criteria schools have to meet to get a certain rating — really matters. An accountability system that gives high ratings only to schools that demonstrate high performance or fast improvement for all groups of students that they serve sends one signal. A system that gives high ratings to schools that are doing well on average, but have low results for their African American students, for example, sends another, very different message. In recent years, many states have chosen to rate their schools based mostly or entirely on overall results, often ignoring the performance of individual student groups. As a result, schools in these states have been able to receive high marks despite low outcomes and little to no progress for some groups of students. ESSA requires that school ratings be based on the results of each individual student group. But states will face a great deal of pressure to give as many schools as possible high marks and to minimize the extent to which outcomes for historically underserved groups of students — including low-income students, students of color, students with disabilities, and English learners — count. As advocates, we must push states to ensure that ratings truly reflect how schools are serving all of their students. What does ESSA require in regard to school ratings? Under ESSA2, states have to set goals for improving student performance on state assessments and graduation rates for all students and for each student group. These goals must require bigger gains for groups of students who are further behind. States must also set goals for progress toward English proficiency for English learners. Academic achievement: A measure of how schools’ proficiency rates in reading/language arts and math for all students and each student group compare with state-set goals. For high schools, states can also include student growth as part of this indicator. For high schools, a measure of how graduation rates for all students and each student group compare with state-set goals. For elementary and middle schools, this measure may be individual student growth or another statewide, valid, and reliable indicator of student learning (such as science assessment results). English-language proficiency: A measure of the progress that a school’s English learners are making toward English proficiency. Additional indicator of school quality or student success: Another valid, reliable, and statewide indicator of school quality. For more on deciding which indicators to include in a school rating, please see https://edtrust.org/students-cant-wait/. How much do each of these indicators have to count? States decide exactly how much different indicators count in a school rating. But the law specifies that the first three indicators — academic achievement, another academic indicator, and progress toward English-language proficiency — must each have substantial weight. Together, these indicators have to carry much more weight (i.e., count much more) than the additional indicator of school quality or student success. How much does the performance of each group of students have to count? ESSA is clear that the school ratings have to reflect how schools are doing for all students and for each student group on each of the indicators (except progress toward English-language proficiency, which is only measured for English learners). In addition, the law requires that if a school is consistently underperforming for any group of students, its rating has to reflect that fact. States, however, decide exactly how much group performance has to count, as well as how to define what it means to be consistently underperforming. Ratings must reflect how schools are serving all groups of students, including low-income students, students from each major ethnic/racial group, English learners, and students with disabilities.In recent years, many states put in place school rating criteria that look only at how schools are doing on average and, sometimes, for a “super subgroup” (such as high-need students, a group that includes any student who is low-income, an English learner, or a student with a disability). Under these rating systems, schools can (and do) receive high ratings even when they are consistently failing to serve some student groups.ESSA makes clear that this needs to change. The law requires that ratings be based on how schools are doing for each group of students that they serve, and if a school is consistently underperforming for any group, its rating must reflect this fact. For more on what it means to meaningfully include subgroup performance in school ratings, see the Ensuring that All Groups of Students Matter in School Ratings fact sheet.Importantly, rating criteria have to work hand-in-hand with action requirements. Schools that are consistently underperforming for any group of students (which, under ESSA, have to take action to improve) should not be able to receive a good rating. And the state must make clear what steps schools receiving each rating have to take and what kinds of support and resources they are eligible to receive. Goals for improving student outcomes need to be both ambitious and attainable.The ultimate goal for all schools and districts is to prepare every single student for success in college and/or a well-paying, meaningful career. But simply stating that this is the goal won’t change the reality of our deeply unequal and inequitable school system. Accountability goals enable states to communicate clear expectations for improvement — including demanding more improvement for groups of students who are too often underserved — so that they can monitor whether schools are on the right track. In order for goals to serve this function, however, they must be both ambitious (meaning, require bigger gains than schools are currently making, especially for groups of students who are behind) and attainable (meaning, that there needs to be evidence that some schools are making the kind of progress that the state is demanding from all schools). For more on setting ambitious and attainable goals, see the Setting Goals for Accountability fact sheet. Ratings must be based predominantly on measures of student achievement and graduation rates.Although states can and should include additional indicators — such as chronic absenteeism or discipline rates — in their school ratings, rating criteria must make it clear that students’ academic success (including progress toward English-language proficiency for English learners) and graduation rates hold the most sway. In other words, rating criteria should ensure that schools with continued low performance for any group of children aren’t excused from addressing that problem just because their school quality survey suggested parent satisfaction went up a point or chronic absenteeism went down a point.Importantly, a rating must be accompanied by a detailed dashboard that clearly presents schools’ results on each of the indicators for each group of students. 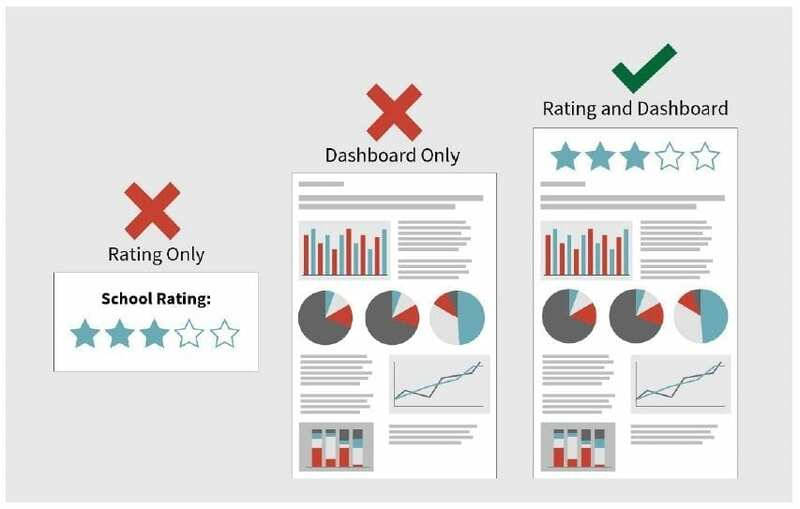 This dashboard can and should include additional indicators that aren’t part of the rating to provide parents with as complete a picture as possible of their child’s school. Ratings must take into account both current performance and progress, including whether schools are on track to meet state goals.A school that is low-performing but making big gains is not the same as one that is low-performing and not improving. Similarly, a small amount of progress for an already high-performing school tells us something different from that same amount of progress at a low-performing school. School rating criteria should include both current performance and progress for all students and each student group, including whether a school is on track to meet the state’s goals. 1Under ESSA, school ratings must be based on results for all students, as well as for each of the following student groups: students from each major racial ethnic group (e.g., Black, Latino, Native American, Asian, and White), students with disabilities, low-income students, and English learners. ESSA also requires states to publicly report results for all of these groups, as well as additional student groups — including male and female students, students who are in foster care, migrant students, and homeless students. 2This section summarizes requirements that are in the Every Student Succeeds Act. The U.S. Department of Education may clarify or add more detail to some of these requirements through its regulations, which were being finalized at the time this document was prepared.